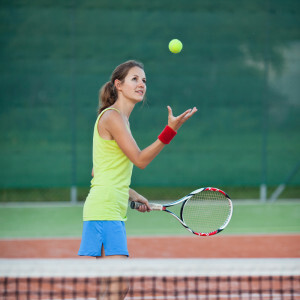 Tennis elbow typically occurs in people between 30-50 years of age. People with certain occupations, such as plumbers and carpenters, who perform repetitive twisting and straightening movements of the wrist, are more likely to develop tennis elbow. Racquet sports players may also develop the condition due to gripping their racquet firmly whilst playing certain shots. But equally it may be due to a poor shot technique or use of a wrong size racquet! The repetitive twisting and extending movements of the wrist lead to small tears in a muscle that inserts at the lateral epicondyle (the bony prominence on the outer aspect of the elbow). This particular muscle is known as the extensor carpi radialis brevis. The tears cause inflammation and scarring in the muscle and its tendon where it inserts around the outer aspect of the elbow. This leads to pain particularly when placing stress through the muscle. Usually the dominant arm is affected, since this arm performs the repetitive movements that lead to overuse and damage of the muscle. Pain on twisting or straightening the wrist is characteristic of tennis elbow. For example plumbers may experience the pain when turning a spanner and tennis players when gripping a tennis racquet. This is because they are placing stress on the muscle that is damaged. The outer aspect of the elbow is also tender to touch. In some patients the pain may spread down the forearm. Loss in muscle strength with resultant difficulty in holding objects and loss in a full range of elbow movement may also occur. A medical history and clinical examination of your elbow is the first step and usually enough to reach a diagnosis. X-rays may be performed to identify any elbow arthritis. More advanced imaging such as MRI may be needed when the diagnosis is in doubt. You may require nerve conduction studies if damage to any forearm nerves is suspected. Initial treatment measures such as activity modification, physiotherapy and regular painkillers are successful in most patients. Movements such as twisting and gripping, which cause pain, should be lessened to allow the muscle and tendon to recover. You may need some time off work to allow this recovery to happen. However, elbow movements should not be completely stopped as this may lead to elbow stiffness. Physiotherapist directed flexibility and strengthening exercises can help alleviate symptoms. Wearing an elbow brace may also reduce the stresses applied to the forearm muscles and allow them to recover. If the condition is related to a sporting activity then advice from a sports coach on modifying your technique or changing your equipment may be helpful. Regular simple pain relief (e.g. paracetamol) and non-steroidal anti-inflammatory medications (e.g. ibuprofen) usually reduces pain and inflammation at the elbow. Anti-inflammatory steroid injections into the painful region also provide short-term pain relief and are performed in the clinic. Other treatments, which are less widely practised, include shockwave and ultrasound therapy to the elbow. The above conservative measures are usually trialled for up to a year and symptoms monitored at clinic. Most patients find that their symptoms improve after a few months. Surgical treatment is an option should the above measures fail or symptoms worsen. Surgery aims to reduce the pain and inflammation experienced in tennis elbow by removing the damaged area of the affected muscle and tendon. This is most commonly the extensor carpi radialis brevis muscle and tendon. The remaining part of muscle is then re-attached to bone. Mr. Naqui performs surgery for tennis elbow at a number of hospitals around Manchester (see Hospitals page). A scar measuring about 3cm is needed around the elbow to directly view and cut away the damaged region of muscle and tendon. Surgery usually lasts 20 minutes and is performed under local, regional or general anaesthetic. Patients usually go home the same day with their arm in a splint. Non-dissolvable sutures are used which will be removed at 10-14 days by your GP or in the Hand clinic. Taking simple painkillers (e.g. paracetamol, ibuprofen) regularly for the first few days after surgery will help reduce any post-operative pain. Mr. Naqui and the physiotherapist will provide you with specific regular elbow exercises to follow after surgery to give you the best chance of regaining muscle strength and pain-free movement. You will be followed up in Mr Zaf Naqui’s clinic within 2 weeks of surgery. This is dependent on symptom severity, your normal daily activities, the surgery performed, and your rate of recovery. Following a discussion with you a specific recommendation will be made based on these factors. Manual workers whose occupation was the main cause behind developing tennis elbow may need to discuss a modification of their work activities with their employer or take some time off work to enable a safe recovery. Sports players may also need to discuss technique modification with their sports coach or stop the sporting activity until they have recovered. Full recovery may take from 6 months up to a year. Common complications include pain, stiffness and some loss in muscle strength. Since patients often continue with the occupation that initially caused their tennis elbow, it is possible that the condition will recur. The risks of post-operative infection, nerve and vessel injury are small.